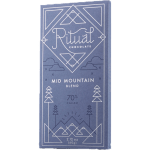 Robbie Stout and Anna Davies founded Ritual in 2010, with a mission to revive the focus on quality in the chocolate world. At their small factory in Park City, Utah, they are involved in every step of making the chocolate, to ensure quality is part of the whole process. They are committed to supporting the people who grow the raw ingredients for their chocolate. 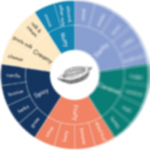 By including no added flavours in their chocolate, they aim to highlight the unique flavours of chocolate from each origin. As well as being passionate foodies, the team at Ritual chocolates are lovers of the great outdoors. They recommend tasting this bar with a cappuccino after a long bike ride!